Beckwithshaw were quick out of the blocks and it was clear to see why they elected to bat first – speeding their way to 49 inside the first 5 overs. Joe Smith retiring with a well made 20. The introduction of Jacob Procter stemmed the flow of runs somewhat, ripping out the middle order with 3 clean bowled and a super catch by Ben Brennan in the deep. JJ finished with 4 wickets for 17 from his 4 overs. Ben Ward, a crowd favourite, cemented his place once more. Bowling with control and to one side of the wicket to claim 1 wicket for 10 runs from his allocation. Knaresborough’s fielding was mixed, yet encouragement brought direct hits by Oli Dexter and Max Bachellerie to slow the run rate more. Matthew Everstead, the Freddie Flintoff of the side, injected pace and accuracy to prevent Beckwithshaw breaking away. At one stage it had looked ominous – 84 runs with 7 overs left. Clever bowling changes and keen fielding ensured the visitors closed on a competitive 105 for 9. Positive running by opening pair Ben Brennan and Max set the tone for the innings. A chance too many caused the run out of Max for an all too brief but entertaining 3. Ben continued undeterred playing some lovely crisp shots to retire with a well constructed 21. Unfortunately the home side struggled against the accuracy of Beckwithshaw’s attack. Oli, Jacob and Harry were unable to seize the tie Knaresborough’s way. Harry did well in the number 6 berth. Luke chanced his arm in an attempt to wrestle the initiative but he, like others, succumbed to accurate bowling by the Beckwithshaw Braves. Kyan, on debut was courageous but again he and Will Wilson fell playing risky shots in vain. 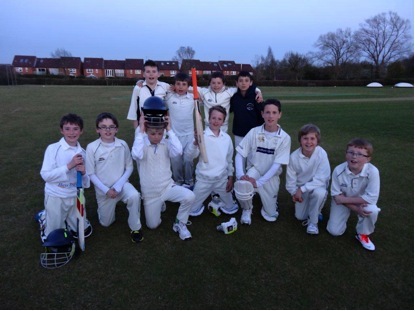 An entertaining last wicket partnership between Ben and Lewis Francis (after his great display on Monday), brought respectability to proceedings. Ben finishing on 11 not out and Lewis 7 not out. The innings closed on 83 for 9. Knaresborough were defeated but not deflated and live to fight another day. Well played boys, you turned the game to ensure 105 was within range.. Beckwithshaw are a good side and you gave a good account of yourselves. This entry was posted in Uncategorized on May 3, 2013 by knaresboroughcc.